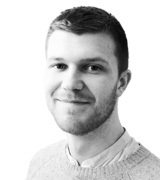 September 01, 2015, 3:01 p.m.
An MP who claimed expenses to clean the moat on his estate, a Conservative Party donor and 26 Tory MPs, 11 Lib Dems and eight from Labour are among the 45 new appointments to the House of Lords this year. The upper house is now the second largest parliamentary chamber in the world (beaten only by the 3,000-member Chinese People’s Congress), and its membership has increased from 666 in 1999 to more than 800 today. New YouGov research suggests that British people don&apos;t want more politicians in the chamber at all, regardless of their political stripes. 60% of people say there are too many, 10% say their number is about right and 3% say there are too few. This isn&apos;t a divisive issue – they are unambiguously the least popular of any profession for any demographic group. Celebrities are also unpopular. 39% say there are too many – which doesn&apos;t bode well for anyone considering following in the footsteps of American rapper Kanye West, who recently announced his intention to run for President in 2020. Service-people, scientists and academics are the most popular candidates for Lords membership. The public are divided on business people, who already have a substantial presence in the Lords. 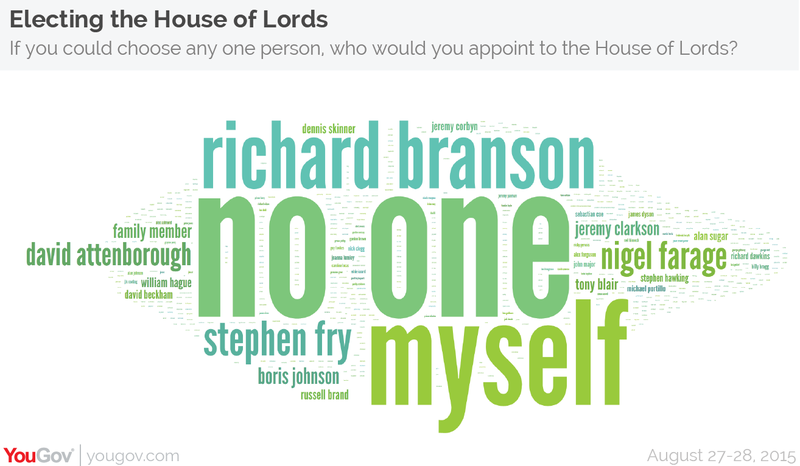 In spite of that, Richard Branson is the most popular individual when British people are asked to write in their personal favourite for appointment, followed by Stephen Fry. &apos;Myself&apos; and &apos;no one&apos; / &apos;abolish it&apos; are however the most chosen responses. 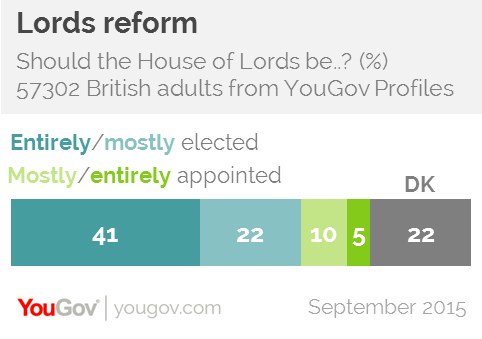 There&apos;s a twist, however: YouGov Profiles data shows that when asked, 63% of the public say the Lords should be mostly (22%) or entirely (41%) elected, while only 15% say it should be mostly (10%) or entirely appointed (5%). So if voters follow their own preferred solution for the Upper Chamber, they&apos;ll get a lot more of precisely the people they don&apos;t want.